Taken as a series of individual events, my 2004 had some really low points. I won't go into them (any more than I already have throughout the year), but I will say that I'm rather relieved to have the chance to start a fresh, new year. I'm optimistic that 2005 will be a significant improvement over its predecessor for me and my family. As for the rest of the world, I can only keep my fingers crossed...oh, and donate money for disaster relief. 2004 had some high points for me, too. I got a wonderful job that allows me more creative expression than anything else I've ever done for a living. I made some new friends, started this blog and bought a car I really like. Favorite Book: The Curious Incident of the Dog in the Night-Time by Mark Haddon. I read a lot of books this year, but this was the one that stuck with me the longest after I finished it. Favorite CD: Scissor Sisters. I'll admit I'd never have discovered this band without the recomendation of a younger and cooler co-worker, but once I heard their disco/Bee Gees version of Pink Floyd's "Comfortably Numb," I was intrigued enough to buy the CD. The band's mixture of influences - the aforementioned Bee Gees, Elton John, Queen, Thomas Dolby, Howard Jones, Billy Joel and various 70s glam groups - blend to produce a sound unlike anything you'll hear on the radio right now. Favorite New TV Show: Lost. I know, everybody keeps going on and on about "Lost." But what else are fans deprived of "The X-Files," "Buffy the Vampire Slayer" and "Angel" to cling to? Favorite Movie: The Incredibles. Notice I didn't say this was my favorite animated movie. "The Incredibles" was the best movie of any kind I saw last year. It's such a treat when blockbuster burnout is remedied with great storytelling and amazing visuals. The latest Harry Potter movie was a close second (almost a tie). That's all I can think of off the top of my head, which probably means it's enough. Finally, here's a fun compilation of New Year's Superstitions from Snopes.com. I wish all of you a safe and fun New Year's Eve celebration tonight and a great 2005. It's a good thing all my favorite shows are running re-runs right now. Otherwise, my usual habits of sloth, procrastination and disorganization would be even more pronounced. Addressing almost all of my Christmas cards (but it's okay because I got ones that say "Merry Christmas and Happy New Year"). Tackling the mounds of dirty laundry in my basement that date back nearly a month. Buying cat food for four increasingly nagging creatures who seem to expect it. The only variety of cat food I've found that keeps the cats from hurling copiously and often comes in a ridiculously small bag that only lasts a few weeks. What? I could buy more than one bag at a time? That's crazy talk! Banish the Christmas tree and other holiday decorations from my sight. Gather my business tax paperwork and mail it to my accountant before my stalkers from the state department of revenue start hounding me in person. Keep a' goin' on that laundry until the baskets are empty. After all that I'll be free to start the new year with a relatively clean slate. I think that's far more satisfying than any list of resolutions. It's Wednesday, which means I have no time at all for chit-chat. However, I'll take a moment to toot my own horn thank some people for their thoughtful recognition of this blog. First of all, I'd like to thank Yvonne DiVita at Lip-Sticking for including me among her favorite blogs of 2004. I can't remember which of us found the other's blog first, but I highly recommend that you read her thoughtful posts about marketing to women if your job or interests take you in that direction. Second, I understand that Average Jane has been nominated for a Best of Blog (BoB) award for Best New Blog. Apparently voting runs January 1-14, 2005, so if you think this blog is worthy, by all means stop by the BoB site and cast your vote! Update 1/1/05: Oops, I spoke too soon. It turns out I wasn't a finalist in the category, so you can't vote for me after all. Feel free to stop by and vote for other blogs, though. I'm not bitter. Finally, a big thank you to everyone who's added Average Jane to their blogrolls and/or featured it in their blog posts. I write it mainly for my own entertainment and to minimize the number of random e-mails I send to my friends. It's very pleasing to know that other people sometimes enjoy what I have to say. I had lunch at a Chinese restaurant yesterday, which left me with horrendous garlic breath and a scolding from my fortune cookie: To be loved, you must be lovable. Considering that I had been mondo crabby to my husband all day Sunday, it struck me that the fates were delivering a little spanking wrapped in a sweet, crispy shell. One of my friends got a classic fortune that I've received before: Pray for what you want but work for what you need. She found it disappointing, but I've always thought of it as good, practical advice. For a long time I held onto this fortune: The star of wealth is shinning upon you. I'm not sure what "shinning" actually accomplishes, but by now I've come to the realization that it does not involve any actual transfer of wealth to me from the star in question. Maybe the first two "n"s in "shinning" were supposed to be "t"s.
I often find stray fortune cookie slips when I clean out my purse. I don't know why I keep them, considering that I could easily picture myself with a job writing fortunes all day long, occasionally inserting a bit of humor but trying to stay vague enough that every recipient can say, "Wow, it's amazing how much this applies to me right now!" The fortunes I really hate are the ones that aren't fortunes at all. I don't mind extras like lucky numbers and Chinese vocabulary words, but I resent getting a little platitude instead of "You will inherit a large sum of money." Then again, I don't like the inheritance fortunes either because they mean that someone who regards me highly enough to want me to have some money is going to die. You always have to consider the "Monkey's Paw" angle when it comes to the seemingly good fortunes. If you're already a fortune cookie skeptic like me, it won't surprise you to learn that fortune cookies aren't really a Chinese tradition. They're actually an American creation, and the fortunes are written just as randomly as I described above. Therefore, I confidently give you this Average Jane readers' fortune: You will meet someone who will change your life. That's a pretty safe bet, don't you think? The book The Pirates! In An Adventure With Scientists. I read it yesterday morning and found it highly entertaining. It's sort of a cross between a Douglas Adams book and the movie Cabin Boy: pirates and anachronistic goofiness galore. Here's the Pirate Captain's blog, in case you're interested. Rudy, the tissue box holder shaped like an Easter Island statue. I'm trying to figure out how to mount it on our bedroom wall. It'll look great across from our cobra-shaped, brass candleholder sconces. A new microwave! My sister could no longer stand to watch me irradiate myself with her cast-off, partially operational microwave from 1997. Now I have a sleek new microwave that actually matches my other appliances (no more faux woodgrain!) and may save me from future burned bags of microwave popcorn. A container of Sunny Seed Drops, delicious chocolate-covered, candy-coated sunflower seeds. And from my husband, who wasn't supposed to get me anything, a Bose Wave Radio (woohoo!). It's already making me spend more time in the kitchen than I ordinarily would. So how about you? Did you get anything really good? This is the first Christmas in a long time that I've really looked forward to the holiday. I managed to get all of my shopping done fairly promptly (and it looks as though my last-minute Amazon gifts will all make it on time). I've attended several very nice parties, baked just enough holiday goodies and decorated my house minimally but effectively. Believe it or not, the most fun I've had all week was at band practice on Tuesday night. Not only did we spend two productive hours going over more than a dozen songs, but I got to play with a kitten! Our guitarist's daughter was home for the holidays with her kitten, Zoe, in tow. My youngest cat is 14 years old, so it's been a long time since I've witnessed the crazed, curious energy of a kitten. I made it home with a few minor puncture wounds, but it was worth it. This will be my last post of the week. I'm spending tomorrow helping my stepmother prepare Christmas Eve dinner. I hope all of you have a beautiful weekend, whether you spend it celebrating Christmas or just taking advantage of the break in your usual routine. All through the early part of December I was wrapped up with pre-travel planning, then travel, then post-travel laundry and housekeeping. Thus, it was kind of a shock when I realized that Christmas is coming - and it's coming very, very soon. I'd done a bit of shopping before my travels, but I spent a lot of time panic-shopping after work last week. Today I completed my gift shopping, went by the liquor store to get a $20 bottle of port for Christmas Eve and finally bought some groceries so I could handle the appetizers and desserts that will be expected of me throughout the rest of the week. I thought that rum balls would be a nice treat to give out in bundles as gifts. Clearly I must have been suffering from a serious bout of forgetfulness about the rum ball making experience. I'm going to share my sister's delicious recipe with you in a moment, but don't plunge in until you've read the postscript. Mix together sugar, rum and corn syrup. Melt chocolate chips in microwave (1 minute, stir, then one minute more) and add to syrup mix. Stir in wafer crumbs and nuts. Roll into 1-inch balls, then roll in sugar. A standard 12-ounce box of vanilla wafers, ground up, makes about half again the volume of crumbs you need for this recipe. Thus, you can increase the other ingredients by 50% and make a bigger batch. It takes for-frickin'-EVER to roll all the balls even if you don't make extra, so keep that in mind when you make your decision. Let the mixture sit a while before you start making the balls. It needs to solidify a little. You could chill it, but I think that would be overkill. You'll want to rinse your hands in warm water periodically because they get really sticky. I recommend using a spoon to roll the balls in the sugar and transfer them back out. It keeps your hands cleaner. My sister reports that the original recipe for these said something crazy about letting them sit eight days before serving. WhatEVer! They're fine the next day. On Sunday I woke up at about 5:00 a.m., long before my husband could be expected to get up. I packed my suitcase and the garment bag and took the elevator down to get my morning Starbucks fix. Ranging about the casino floor were numerous groups and individuals who were still up from the night before. As you might expect, most of these people were quite drunk and provided me a great deal of entertainment as I sipped my caffeine and ate my cherry danish. Our friends K. and M. arrived at 9:00 a.m. to take us to the airport. They had a flight home on Southwest; we were headed back on America West because I'd gone the "bargain" route with Expedia.com. We had a good hour before our flight took off and that seemed like plenty of time judging from our airport experience on the way in. We walked through the terminal doors and were greeted with a scene that gave the impression that everyone in Las Vegas had been ordered to evacuate immediately. The lines snaked around in all directions and I wasted valuable time trying to check in at an electronic kiosk, only to discover that I had no choice but to stand in a different, long line to check in personally. It took a while to get boarding passes that would allow us to sit together, so by the time we checked our bags and reached the line for the security checkpoint, our schedule was getting tight. We made it through (no underwire this time - she CAN be taught! ), boarded the plane and walked to the back to find our seats in the 23rd row. Unfortunately for us, the plane in question didn't actually have a 23rd row. We and four other frustrated 23rd row passengers were herded back off the plane and it wasn't long before we watched it take off without us, carrying our luggage to various destinations that none of us would see anytime soon. It was still early in the morning, so the whole thing seemed like an unexpected adventure. We each received a $100 flight voucher and the airline staff worked feverishly to find us another flight. After a pretty good wait, our gung-ho airline rep told us to RUN! to another gate with her. She'd gotten us a connecting flight to Dallas (instead of Phoenix, our original connection destination). We ran as fast as we could on our pain-wracked feet and ended up sitting in separate rows among the many Texans who'd spent the weekend in Las Vegas at a big rodeo. The flight was supposed to take off immediately. Instead, it sat on the tarmac for an HOUR before it finally took off. I was reading and dozing the whole time, but my husband was fuming. He hates to fly and he's tall, so his discomfort level was off the scale. When we finally arrived in Dallas, we had less than 20 minutes to get to our connecting flight home. It was in a different terminal. An airline employee told us that we could get to the next terminal if we walked "just around the corner and up the escalator" to a tram. "Just around the corner" turned out to be about a quarter of a mile. We finally boarded a noisy, bumpy, rickety tram which inched along the track...until it stopped altogether. By then, we had one minute left until our flight took off. We imagined we could see it taking off as we waited. I called my dad and told him not to swing by our house at 7:00 p.m. because we wouldn't be there. The tram finally started up again and we reached the gate that would have been ours if our plane hadn't been long gone. My husband was a roiling cloud of low blood sugar and elevated testosterone levels, so I asked him to stand aside while I went to the counter and used the "We need your help" approach (which worked wonderfully). The woman at the counter got us on a flight leaving less than an hour later, which gave us time to eat some frozen yogurt and drink some water. At the airport magazine shop I had my only celebrity sighting of the entire trip: Anderson Cooper from CNN. Our boarding passes for the final flight were for seats in separate rows again, so I approached the desk at the gate and asked if there was any chance we might be able to get seats together. Not only did they manage to seat us together, but we ended up in bulkhead seats right behind First Class. That meant my husband could stretch out his legs in the aisle and I could put my feet up on the wall. Hubby was very impressed with my powers of persuasion. I credit my sister with teaching me her motto: "If you want something, you might as well ask." The flight was brief, relatively comfortable and uneventful. When we reached the terminal, we had to search for a while before we found our luggage, but we managed to retrieve it and we finally got home around 9:00 p.m. K. and M. had beat us home by probably 7 hours. All in all we had a great trip, but I think it will be a while before I manage to get my husband on another plane. I'll have to start thinking of our next destination...somewhere within driving distance. The limousine from the wedding chapel was supposed to pick us up at 4:30 p.m., so we didn't have a lot of time to get ready. Fortunately I was having a good hair day, so all I had to do was put on my dress and shoes and apply a little extra makeup. My husband had bought a new shirt to wear with his suit, but he hadn't tried it on in the store and of course it didn't fit. We wrangled a bit about the desirability of his standard of dress complementing mine and he eventually chose another shirt to wear with the suit. Our friends, K. and her husband M., called to say they were running late, but we weren't sure what would happen if they didn't make it to the hotel by limo time, so I urged them to try to stay on schedule. We ended up down in the lobby early and it didn't take long for me to realize that the high-heeled sandals I had on, while very pretty, were going to be foot-killers. I'd deliberately chosen the short ceremony: two songs from Elvis and the renewal of vows ceremony. Sure, the whole Elvis thing is kitschy and fun but enough is enough. 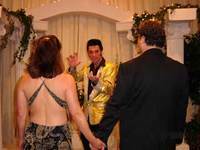 We decided to have Elvis walk me down the aisle, which he did while singing a variation of "Love Me Tender." He then conducted a fairly straightforward vow renewal ceremony, followed by an second set of vows drawn from Elvis song lyrics ("I promise to never treat you like a Hound Dog," etc.). At one point during the ceremony, I caught my heel in the hem of my dress and it quickly became evident that discreet wiggling was not going to get it loose. Preserved forever on the videotape of the ceremony is the sight of me awkwardly hopping on one high-heeled foot as I free my heel right in the middle of the ceremony. Heh. After the limo took us back to our hotel, K. and M. retrieved their rental car and we all went to the Sahara to kill time before our dinner reservation at the Top of the World Restaurant in the Stratosphere. At the Sahara, I put $1.00 in a "Wayne's World" themed slot machine and won $10.00, which I immediately cashed out. It was my biggest win of the trip. We decided to have a drink in the lounge and were treated to a performance by Lena Prima, daughter of the late Louis Prima. She and her band were quite good, but her entire act consisted of songs her parents had recorded (her mother sang in her father's band), reminiscences about her parents, home movies, photos, TV show clips, etc. Her entire professional life is the equivalent of a visit to elderly friends of the family that never, ever ends. I couldn't help wondering whether, deep down, she enjoys or resents her act. We had a lovely dinner at Top of the World and the view was indescribably spectacular. The entire dining area of the restaurant rotates about one revolution per hour, so we got to see all of the lights of Las Vegas as our meal progressed. It was a delightful end to a full and satisfying day. Tomorrow: Can we please just go home now? On Saturday morning, I woke up well before my husband and decided to go out and see what I could see. After a Caffe Americano and a pastry from Starbucks, I walked around the casino donating my spare change to various slot machines. One thing about Las Vegas that I'd forgotten was how many people smoke in the casinos. Sure they have heavy-duty air cleaners, but every casino still reeks. A new thing about casinos since my last visit is that the slot machines are much quieter than they used to be. Very few machines pay off in cash anymore - they issue little printed tickets that you can trade for cash later on. It's rather anticlimactic. Anyway, I walked around the MGM casino until I saw a sign that said "Lion Habitat." It turns out that the MGM Grand keeps several lionesses and cubs on display in a big, zoolike habitat. They weren't out yet, but the journey led me to an outside door and I discovered that all of the big hotels at that end of the strip are joined by walkways and trams. I first walked to New York New York, right across the street. They have a roller coaster that travels around the outside of the hotel and through the casino, but it wasn't operating yet or I'd have taken a ride. I walked through various shops and the casino for a while before I decided to go back and wake my husband up. After another breakfast with him, we went and watched the lions for a while, then walked back across to New York New York. My husband was determined to fill up his camera's memory card with photos, so our progress was a little poky. It didn't take long for my cripping foot pain to return, so I bought a pair of shoes from one of the shops - a size larger than I would ordinarily wear. We eventually explored NYNY pretty thoroughly, then took a tram from Excalibur to Mandalay Bay. Our initial thought was that we wanted to see the aquarium and shark reef at Mandalay Bay, but once we finally made it there, we decided that $15 per person for a potentially time-consuming activity wasn't in the cards (ha - a little Vegas joke!). It turned out that the convenient trams and walkways were only designed to get you INTO the hotels. Getting OUT of them was another story altogether. It took more than an hour from the time we decided to leave until we finally made it back to our hotel. We had a few minutes to rest and then it was time to start getting ready for our big renewal of vows ceremony.